The U.S. silver dollar was the last of the silver coins to adopt the Seated Liberty motif. At the same time, it can be said it was the first to feature the seated Liberty. That's because the Seated Liberty theme originated with the Gobrecht Dollar in 1836 The obverse pictured Lady Liberty sitting on a rock, looking to her right, while holding a Union shield. In her left hand she grasps a liberty cap on a pole, emblematic of American freedom. An eagle in flight rules the reverse of the Gobrecht Dollar. In 1837, Gobrecht's seated Liberty was introduced on the obverse of the dime and half dime, with some minor modifications, such as toning down Liberty's muscular arms. These carried reverses distinct from Gobrecht's flying eagle, hence the origination of a new coin which we today call the Seated Liberty type. The quarter and half dollar followed suit in 1838 and 1839, respectively, followed by the silver dollar in 1840. Seated Liberty Dollars were coined consistently from 1840 forward, though never in great numbers. In addition, each year a few dozen Proof dollars were produced. In their day, the relatively small supply of Seated Liberty Dollars were seldom seem in U.S. circulation, mostly because of exportation to Asia for use in trade, and heavy melting elsewhere. The Gobrecht Dollar of 1836 was the first U.S. coin to feature the figure of Liberty seated upon a rock. Seated Liberty coinage of 1837-1891 largely reproduced the obverse design from the Gobrecht Dollar, but there were a few modifications. One change was the shape of Liberty's right arm. 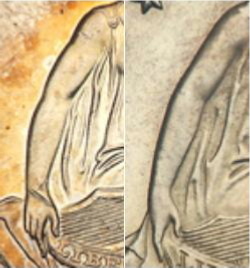 On the Gobrecht Dollar (left image above), Liberty's arm resembled that of a weightlifter. The decision was made for Seated Liberty coinage (right image) to give her a sleek, more feminine arm. In 1866, the IN GOD WE TRUST motto was added to the reverse, just above the eagle, for all Seated Liberty coinage, quarters and larger. We know of only a single example of a quarter and half dollar lacking the motto. Also, two 1866 No Motto silver dollars are confirmed to exist. These No Motto specimens were minted somewhat clandestinely for Robert Coulton Davis, a Philadelphia druggist and collector with friendly ties to the Mint staff. The 1866 No Motto Seated Liberty coins have amazing chronicles familiar to most avid numismatists. The quarter and half dollar, plus one of the silver dollars, were stolen in a 1967 armed robbery from the du Pont family home in Coconut Grove, Florida. The coinage trio has since been recovered in separate incidents. The silver dollar was returned in 2004 by a Maine librarian who received it in a box of old coins many years prior to that as collateral from a friend to whom he had loaned money. Upon learning about the 1866 No Motto dollar in late 2003, the librarian got curious and reviewed the contents of the coin box and suspected he had the stolen rarity in his possession. He asked a numismatic expert to have a look, and sure enough, it was indeed the missing du Pont dollar. How the librarian's friend acquired the coin is something we may never know, for he died in 2001. The coin was eventually reunited with the quarter and half dollar, all of which are now on display at the museum of the American Numismatic Association. The other 1866 No Motto dollar, considered to be a lower grade than the du Pont specimen, was sold in January 2005 for nearly $1.21 million. Production of the Seated Liberty Dollar continued every year until 1873. In February of that year, Congress passed a coinage act ending silver dollar minting. What's more, the law mandated that silver dollars were no longer legal tender; that is, they were no longer acceptable as money. This was in response to the falling price of silver brought about by large silver strikes in western states. When silver producers and other supporters of unlimited silver coinage realized the U.S. government was no longer buying silver, it set off an uproar. The "Crime of '73", as it was denounced by its opponents, incited a furious gold/silver debate that painted U.S. politics for the rest of the 19th century. 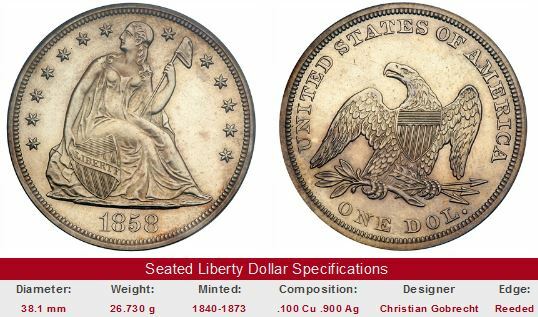 There are many scarce dates in the Seated Liberty Dollar series. The 1866 No Motto dollar, as explained above, is virtually unobtainable. The 1851 and 1852, both originals and restrikes, bring at least $25,000 every time one is put up for sale. The 1870-S is a major rarity; only about 10 are currently known. Based on fairly recent activity, the starting price for an 1870-S is at least $400,000. The 1873-S dollar was a mystery for 135 years. Mint records show that 700 of them were struck, but their fate was not confirmed until the year 2008, when National Archives researchers discovered a June 13, 1873 telegram from Director Linderman to San Francisco Mint Superintendent Oscar LaGrange ordering the melting of all 1873-S dollars. More than likely, they were all destroyed, but perhaps someday, a curious somebody will take a gander at long forgotten coins in an old box and make a major discovery, ala the 1866 No Motto dollar. The Seated Liberty Dollars minted at Carson City have demonstrated true staying power with collectors for ages. For the Seated Dollar buyer wanting coins that will likely increase steadily in value with the passage of time, any Carson City example, properly graded, is a good bet. Just be sure you can trust the seller. Seated Liberty Dollar experts report they see many problem coins, caused by cleaning or other abuses. You can limit your risk by purchasing only examples that have been graded by PCGS, NGC, ICG, or ANACS. The left hand side of each "Sales Box" below is value trend data over a very long period of time for a Carson City Seated Dollar in G-4 condition. The percent annual increase is computed for comparative purposes. The right side of the box is a link to eBay US coin auctions, that pulls the coins of that date, if any, that are currently for sale. Bear in mind, these are rare coins and won't always be found on eBay, so you may have to check back periodically.